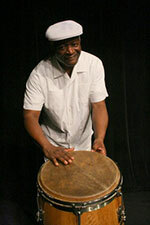 Dr. Eddie Ade Knowles is an accomplished musician with over 40 years of performance, residency, workshop, and recording credits, as a percussionist. Ade’s artistic focus is on African, Afro-Cuban, and New World Percussion, and he has performed and/or, recorded with many well known artists, including Gil Scott-Heron and Kim & Reggie Harris. Ade was also the co-founder and Artistic Director of the Griot Dance Company and The New African Music Collective. Presently, Ade is the Artistic Director of Ensemble Congeros, a group of Rensselaer alums and current students dedicated to the study of African, Afro-Cuban, and New World percussion. The Ensemble was founded in 2004, as an outgrowth of the interest and passion of Rensselaer’s students who excelled in Dr. Knowles’ course, “Introduction to Afro-Cuban Percussion.”On March 30, 2012, Ade celebrated the release of their first DVD entitled, “Ensemble Congeros: Chasing the Rhythms.” It is a lovely testimony of the Ensemble’s unmistakable talent, dedication to each other, and the making of music.